MENDON, Mass. /Massachusetts Newswire/ –This year Southwick’s Zoo is celebrating 50 years as one of New England’s favorite destinations. The zoo’s humble beginnings trace back to the 1930’s with Justin Southwick’s collection of exotic birds. The collection began to attract visitors, so he placed a donation box at the entrance of his farm in 1956. Southwick Wild Animal Farm Inc. was incorporated in 1965. 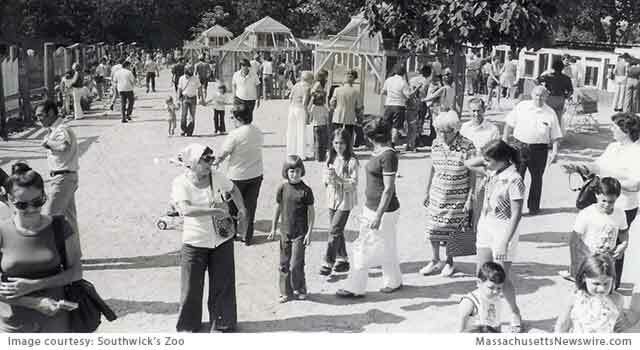 Over the years Southwick’s Zoo has grown to become New England’s largest zoological experience. Southwick’s is celebrating all season long with monthly events. All events, excluding EARTH Bash and the evening concerts, are included with normal zoo admission rates. This will also be the 10th year that EARTH Ltd holds their annual fundraiser EARTH Bash at the zoo. This year EARTH Bash will be held on Saturday, June 20 and will run from 6pm until 11pm. Guests will be able to explore the zoo during the evening and participate in a poker run for prizes. It also includes a dinner, open bar, auction, and more. Proceeds from this event support education programs at the zoo including Wild Adventure Summer Programs, the ZooMobile, and internships. Tickets may be purchased at www.earthltd.org. The zoo’s anniversary festivities begin with the Golden Zoobilation on Sunday, June 28, 2015. This family event will feature performances from the Puppet Brigade, Claflin Hill Youth Symphonies, face painting, and the mural artist ARCY. On July 11 the zoo will hold Celtic Cool, a daylong event celebrating Celtic music and dance. Visitors to the zoo that day will enjoy Irish dancing, fiddling, bagpiping, face painting, and more. Daytime activities will be followed by an evening concert with performances by Blackstone Cuil, Tom Lanigan Band and Erin’s Guild. Sounds of Africa, on August 15, will feature African music with a performance by Gaia Roots Women’s World Music Ensemble, a drumming workshop, and African cuisine. This event will also include an evening concert featuring Gaia Roots, African Balafon Player Balla Kauyote and Shanti Starr and the Afro-Reggae All Stars. Tickets for the Celtic Cool and Sounds of Africa concert can be purchased through Southwick’s Zoo’s website. Harvest Fest, on September 12, will celebrate the bounty of fall with a farmers market featuring local produce and crafts. This event will also include a performances by the Puppet Brigade as well as the Stockwell Brothers Blue Grass Band. The final anniversary event of the season is the week long Halloween event Zoo Boo Days. Children (3-12) in costume receive free general admission and can trick or treat in the zoo during this week. Certain animals will also receive pumpkins to eat and play with. It’s going to be a busy summer for Southwick’s Zoo, so don’t miss out the chance to help celebrate 50 years of zoo memories! Southwick’s Zoo is a privately owned zoo located at 2 Southwick Street in Mendon, Mass. and is home to hundreds of wild animals, featuring more than 150 varied species (many of which are endangered). Southwick’s Zoo’s mission is to provide an extensive zoological collection and educational facility for their visitors. Southwick’s Zoo offers an exciting environment for visitors to learn more about animals and their conservation. Visit us online at www.southwickszoo.com or www.facebook.com/southwickszoo.